I decided to accept it for request because my prayer life has been considerably weak of late - if not frequently non-existent. I have nothing to say about that except I am in the wrong. I hoped that by reading this booklet I would be encouraged to return to prayer and make it a daily discipline once again. The book arrived and I stuck it in my suitcase to take with me and read while I was in California with family over Christmas. As it turns out, I didn't find a single moment to crack open the pages of this book. Instead of reading, I spent my time visiting with my family - particularly with my mother-in-law. She is a prayer warrior if ever there were one. I've heard her talk of her prayer life before. I've seen her reading her Bible and journaling. I've listened to her prayers as she prays over me and over others. Perhaps because I was attuned to my own need to "get back into the game" I noticed her habit of prayer even more than I have in the past. When a situation popped up she held my hand and simply said, "We will pray." And I did. And I know she did. Her example and exhortation was worth more to me than a pile of pamphlets, even though they may be written by Martin Luther. I love my mother-in-law because she is honest. If the picture isn't pretty, she won't tell you that it is. She does not put on any false pretenses about who she is as a Christian or where she is in her spiritual walk. She'll honestly tell you her faults and flaws, without making excuses for a single one. She does commit each fault, flaw and anything that is not Christ-minded to the Lord in prayer. She also prays for each member of our family. And I know that her prayers are answered. I know. Her spirit of humility and committment to follow Christ was a huge spiritual wake-up call to me. She exhibits the truth of what C.S. Lewis explained of prayer; it doesn't change God's mind, it changes who we are as His children. Her life is a beautiful illustration of Christ's redeeming power and being around her makes me want to know God more. Upon my return home I pulled A Simple Way to Pray out of my suitcase. I read it and it was useful, but not as useful as a real life lived out in front of my very eyes. Within the past few weeks I have made it a daily discipline to spend time in prayer. I cannot say that I've used anything that Luther once wrote as a catalyst for this prayer journey, although there were a few things that he wrote and I noted. 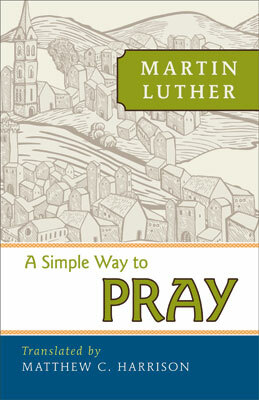 First, Luther recommends that a person pray through the 10 Commandments, the Lord's Prayer and the Apostle's Creed. These things have either being given to us in scripture to memorize and live our lives by, or have been designed by church counsels (i.e., the Apostle's Creed) to establish the basics of our faith in our mind. If you don't know where to start in your prayer life, these are good places to focus. When praying these pieces of scripture (or the Creed) you are forced to think about Who God is and who You are. However, Luther is not promoting rote prayers. As you are praying using these tools which God has placed at your disposal (particularly the Lord's Prayer), he says you will find God speaking to you. I'm grateful for this little booklet, sure. I think it is very handy and has some great thoughts to meditate on and advice to apply to one's prayer life. It's an easy read and a healthy read. But more importantly, I'm grateful to have people in my life - who God very intentionally put there - to demonstrate what it means to be a Christian and walk hard roads, graciously and gratefully, knowing that it's not about who I am but what I need. I need God. Thanks to Concordia Publishing House for shooting a copy of this booklet my way in exchange for my honest thoughts. I just discovered your blog. I love your comments on prayer, and the godly example of your sweeet mother-in-law! I have a long way to go, but I hope to demonstrate love and Christianity to my daughters-in-law as your mother-in-law does for you. How blessed it is to be salted and stirred by one of God's own! Prayer warriors in life give heart to our calling and make me feel so humble and blessed to be a part of a family who's war cry is prayer, who's life essence is to give all circumstances to God! What a peaceful and restful state we are called to. I would like to read this book on Luther's thoughts, it's always good to be re-encouraged to use prayer daily, I like the thought of praying through the Ten Commandments, the Lord's Prayer and the Apostles Creed. Thank you for reading and reviewing this book and for sharing your prayer experience. Love this post! I'm ever so grateful for books and what we can learn from them (you know that!) but I'm even more grateful for the "one another" the Lord has blessed us with in this life. To be able to follow someone else's example as they follow the example of Christ. . . I've used many Scriptures as a beginning to prayer, particularly Paul's prayers in Ephesians, Philippians, and Colossians, but I have never thought of using the Ten Commandments. You're very blessed to have such a mother-in-law! This is such a wonderful post! I think it's great that you have such an amazing mother in law. Plus, you've definitely given me a push in the right direction concerning prayer. It was much needed!